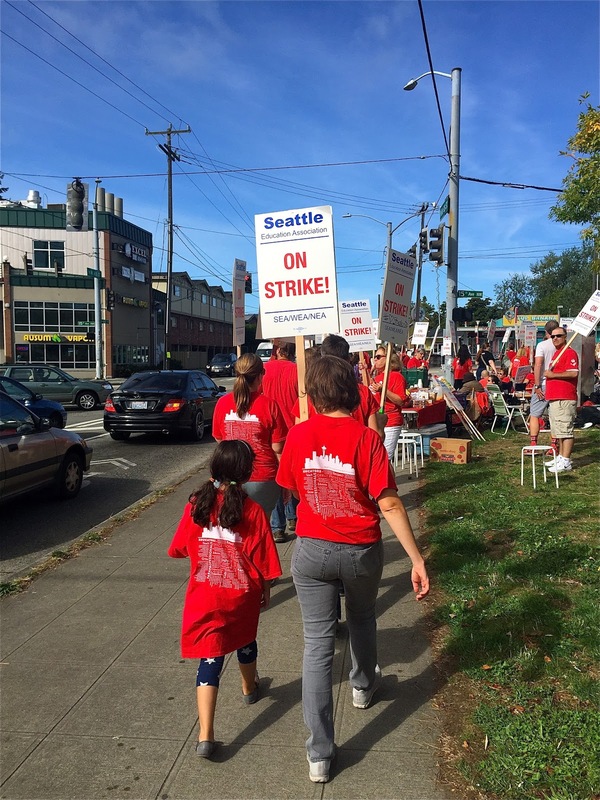 Last week, Seattle's teachers voted overwhelmingly to authorize a strike should their efforts to negotiate a new contract fail. This weekend we celebrate Labor Day. It's an odd thing setting aside a holiday to honor working families given the ongoing war being waged against them by many of the most powerful members of our society, and the outright vitriol coming from elected representatives and business leaders who malign working men and women in vile terms, labeling these working Americans as, among other things, "selfish, lazy, union thugs." At the beginning of summer, on Memorial Day, you will find no shortage of people stepping to the front to wave their flags in honor of soldiers who gave their lives. But at the end of summer, on Labor Day, these very people actually become the "selfish, lazy, thugs" they condemn, enjoying a three-day weekend of picnics and family time, ignoring the thousands who gave their lives so that they can enjoy a middle-class privilege, brought to them by unions. Indeed the middle class exists because of the Labor Movement, although it's not surprising that so many Americans are unaware of this fact, and can be so easily manipulated by politicians with anti-union agendas, because most public schools have relegated this vital piece of our civic history to a few paragraphs in text books, if it's taught at all. And just because you don't belong to a union, don't think that your life is not better because of the long fight in which labor has been engaged on your behalf. The very weekend you are currently enjoying has indeed been brought to you by people who fought and even died because of the radical notion that families should have time to be together, that children should not burn up their tragically short lives in sweat shops and coal mines, that mothers and fathers should expect workplaces where they won't be maimed and killed, that they should not be beaten, have their wages arbitrarily withheld, or be forced to work 61 hour weeks (the average in 1870, meaning many worked far more hours than that) with no hope of a day off. Oh, these were great times for business owners, but they were hell for everyone else. You can thank labor for your employer-based health care coverage, your living wage, your paid sick leave, vacations, and holidays. Without a Labor Movement you would not have workers compensation for on the job injuries, unemployment insurance, pensions, anti-discrimination laws, or family medical leave. You would have no "due process," living at the mercy of your employer, who may well be a good guy, but just as likely is not. Wages and the standard of living, even for non-union workers, in states with laws that support unions are higher; states with union-busting laws have lower wages and lower standards of living. That is a simple fact. I've heard people argue that unions are somehow anti-capitalism (as if that's an inherently bad thing). Of course, I see how a strong union might cut into corporate profits (which are currently, even in this rocky economy, among the highest in the history of the world, in real dollars) but from where I sit unions are pure capitalism. Why can't individuals with a service to sell, be it teaching or steel working, ally themselves together to negotiate the best deal possible? I mean, it's certainly democratic. And isn't that what corporations do all the time with their mergers, acquisitions and strategic partnerships? If capitalism is just for those with capital, then it's clearly and fundamentally anti-democratic and should have no place in our society. I've heard people argue that unions are somehow selfish. I find that a singularly silly assertion. Really? Selfish? People getting together for the common good, sticking together, sticking up for one another, acting in the best interests of "we" instead of "me." That's selfish? Yet somehow a corporation seeking to squeeze every nickel out of the hide of it's most lowly worker isn't selfish? Please. I've heard people use anecdotal arguments that union workers are somehow lazy. I have no doubt that there are actually lazy union workers, just like there is laziness in every aspect of life. But you've got to do better than anecdotes to convince me. The actual research shows that unionized businesses are made more productive through reduced worker turnover which leads to lower training costs and more seasoned workers, which results in not only higher productivity, but better quality. Actual research shows that higher paid workers forces managers to actually do their jobs of more effective and efficient planning. Actual research shows that employers who involve union workers in their decision-making process see an almost 10 percent increase in productivity. Companies like Costco with a high percentage of its workforce unionized enjoy 20 percent higher profits per worker hour than anti-union bottom feeders like Sam's Club. Productivity statistics put the lie to the claim of laziness. And as for the argument that union workers are thugs. Look at the history of the Labor Movement and tell me who the real thugs are. I'm writing about this on my education blog because teachers right across the country, in places like West Virginia, Oklahoma, and Puerto Rico are standing together to demand better wages and working conditions. They have found themselves under full-on assault, and not just from politicians and businesses, but by the so-called "education reformers" who seem to find, without any evidence, that those rotten union teachers are the cause of our "educational crisis" (which in itself is a myth made up solely to serve their agenda of high-stakes testing, privatization and the de-professionalization of the teaching profession). I am not a union member, nor have I ever been, but I'm waving my flag this weekend not only for abused and hard working teachers, but for all of my brothers and sisters who work for a living, who continue to fight for their fare share of this democracy, and who envision a better more egalitarian and democratic future for our children.